Free Activities Seasonal Fun Pass and Beach Service! 1 Free round of golf at a local golf course. * Activities may change without notice. Not available for long-term vacation rental guests. Available March - October for stays less than 15 days. Relax in coastal cottage comfortable in this beautifully decorated two-bedroom/two-bath, pet-welcoming condo. Located on the second floor of the popular and family-friendly, beachside community of Sandpiper Cove, it features a private deck with an expansive view of the lush, green golf course and sparkling, seasonally heated pool. This spacious, open-concept "home-away-from-home" has everything you need to enjoy an idyllic beach vacation. The bright, white kitchen is fully equipped and features a pass-through breakfast bar with seating for two. 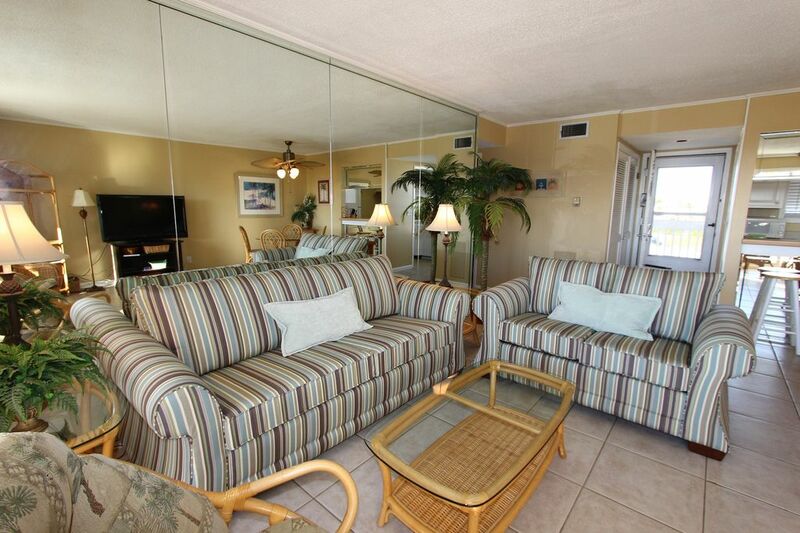 The dining table seats an additional four and the cool, tile floors throughout the unit add to the beach ambiance. Stretch out in the comfortable, island-themed living room and enjoy movies with the family on our large, flat screen television, complete with DVD and free Netflix included. Sandpiper Cove is the perfect, centrally located, family-oriented community with amenities galore. The sugar-white sands and emerald waters of the Gulf of Mexico border this popular property. Spend the day at the beach and you never even have to leave for lunch-the Beach Pavilion, located on your private stretch of beach, offers snacks and drinks, rental umbrellas, chairs, jet-ski's, ocean kayaks, parasailing and restroom facilities. We provide beach service with this unit from March to October so you can enjoy the luxury of two of your own private beach chairs and an umbrella. So everything your family needs at the beach, is right here for your pleasure. This quiet neighborhood nestled among swaying palm trees, features five pools, three hot tubs, a nine-hole/par-three golf course, lighted tennis courts, boat ramp, marina, docks, 24-hour security and the most popular Louisiana Creole restaurant in the Panhandle-Louisiana Lagniappe, located within steps of your door. This is not a high-rise complex; the buildings are only two story. So you won't be overrun with neighbors and the private beaches have plenty of room for the residents and guests of Sandpiper. Your pups and kids will enjoy the large expanses of grass and nice walking areas, away from major streets. And the in-unit washer and dryer ensure that you can travel home with clean clothes! Everything you need is nearby and Destin offers so many different recreational activities, there is something for every member of the family. From arts and culture to eco-tourism, from fine dining to quick bites, from sports and adventure to shopping and spas; the Destin area has it all. Go deep-sea fishing or explore the famed, expansive Choctawhatchee Bay in what is known as the "world's luckiest fishing village." Destin-dining is also world-famous among foodies and regular folks alike. The property was very well maintained. The location was excellent. The beach was close. We enjoyed everything about it. It was a wonderful place to stay. Great atmosphere. The kids loved it. A great little community in a great location! My wife and I spent an uncomfortably cold month of January in Destin, but luckily we were able to spend it in this very nice condo. It is a perfect location for the times you might not be able to spend on their private, beautiful beach. Plenty of shopping, restaurants, movies, golf, museums and music to fill your time. When the weather was good we took long walks in the neighborhood outside of Sandpiper Cove, or on the beach, or on the 9-hole par three course right outside of this well-equipped, tastefully decorated unit with a view. We really liked this very fairly-priced condo, the people and staff in Sandpiper Cove, the electronics provided for the colder days, and the support from the management of our rental. And of course the beautiful beaches of Destin. A wonderful stay in a wintery month. We would do it again in a heartbeat! Lovely condo , I feel it desperately could use a new stove tho , we wanted to use the stove , but the oven is very weak and the burners were all off kilter , hard to fry eggs and make pancakes for breakfast . Also, the twin beds were uncomfortable and squeaky. The last thing, is the pool , its supposed to be ready for use by 8 am , our last day my grandson wanted to swim early but we had to wait while the pool was vacuumed out . Other than that , its a nice clean condo . Everything about this condo was amazing! It was right across the street from the Beach - and centrally located to walk to a lot of restaurants including the incredible on site restaurant which overlooked the Harbor! We would definitely book here again!